The Olivine Tide Pools offer great (if remote) little hike with beautiful tide pools embedded in a craggy lava shelf. 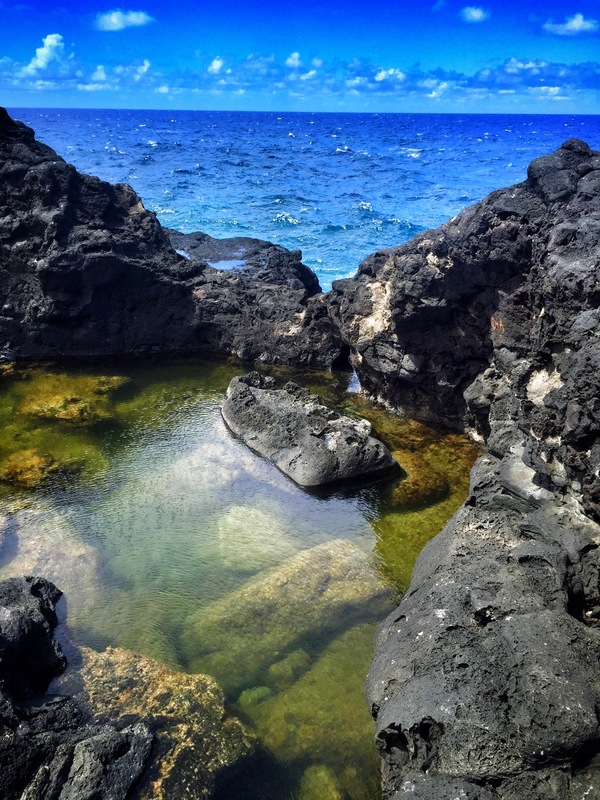 The pools were named after a semiprecious gem found lodged throughout the lava and sandstone cliffs. They range in size from serving bowls to swimming pools. The color of several of these has a brilliant green cast in the right light- a beautiful contrast to the turquoise and indigo blues of the nearby waves and surging whitecaps. 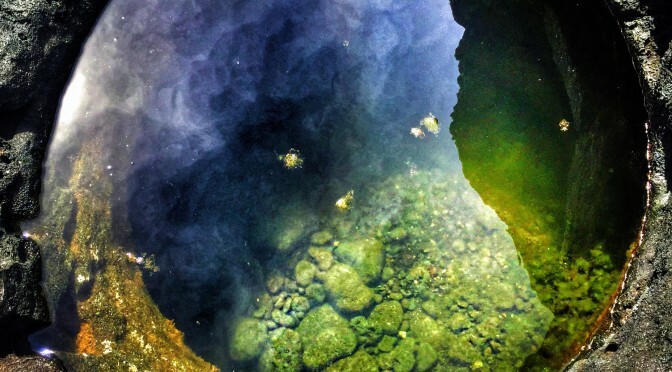 A larger tide pool glows green against a bright blue sea. 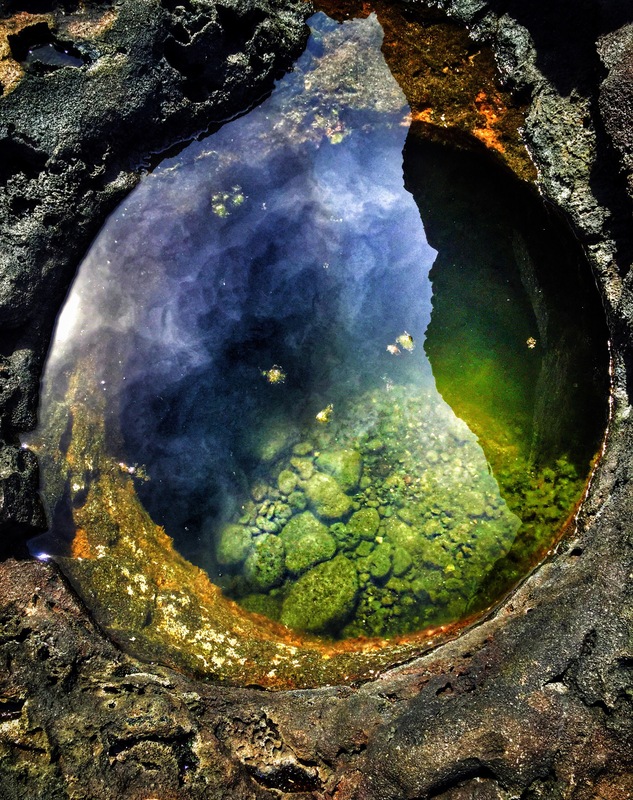 These luminous green Tide Pools come complete with intertidal residents including fish, miniature hermit crabs, periwinkle snails and a crew of cantankerous crabs. A small, but enthusiastic blowhole may be active if you are lucky enough to come at the right time. Teaching your little ones (and yourself) to be awake to your environment can bring up all sorts of interesting questions… here are the answers to just a few. 1. Why do the larger pools have more life than the smaller? Because Hawaii has such a warm sunny climate, the smaller pools tend to get overheated and not have as extensive and varied life as the larger ones. Also, the larger pools can store a greater amount of resources to support life. The location and size of the tide pool in the intertidal zone will greatly affect who can and will choose to live there- such a frequently changing environment requires hardy species! Here’s a link to a pdf of many of the local Hawaiian residents. 2. How does a blowhole work? How does a Blowhole work? 3. How does new (fresh) water get into the pools? What happens when a pool is not refreshed often? These pools are submerged by the sea at high tides and during big storms, and can even receive spray from larger waves. If a pool is not refreshed as often (due to location further away from the water, it can stagnate, with higher bacteria, lower oxygen in the water and far less renewal of nutrients, any residents of this pool may die or be stunted in their growth. See what other things you notice about the pools and their natural patterns- can your little ones come up with a hypothesis why or how something occurs? 1. Safety First. The ocean waves crashing into the lava cliffs housing the pools are unsafe. Don’t try to swim in the area (other than in the larger calm tide pools) and don’t stand too near the edge. Some of the rock cliffs nearby can be unstable. Keep younger and less sure- footed little ones nearby. 2. Solitude seekers should plan ahead. 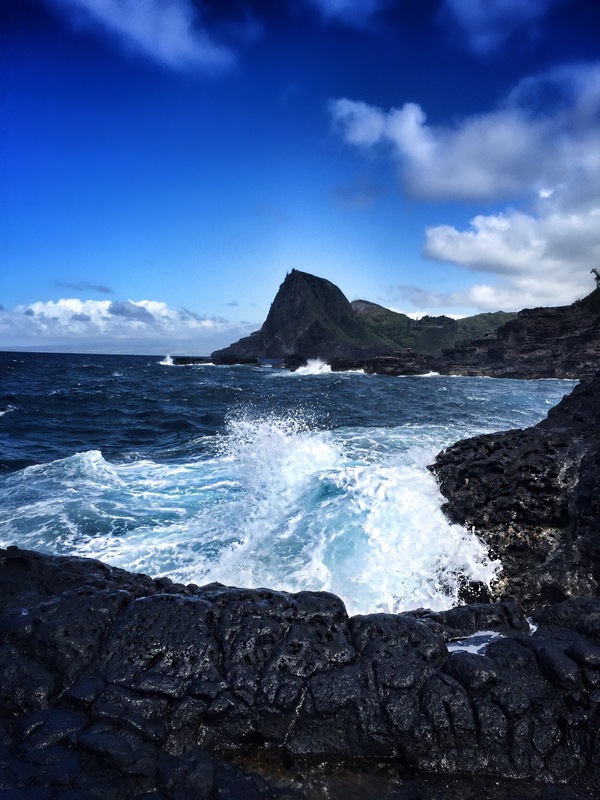 A generous roadside pullout for parking, a common desire to stretch legs midway along the coastal drive, and the relatively short hike down the steep jagged lava encrusted terrain encourages a larger number of visitors. If you are looking for solitude, either go early in the morning or arrive late. 3. Consider Tidal Timing. Come at the right time (NOT during the peak of high or low tide) to experience a cool (if smaller) blowhole that never fails to fascinate young ones. 4. Bring a swimsuit! On weekends you will likely meet other people there, quite a few choosing to take a cool dip in the largest pool. Waves crash and churn against a jagged volcanic shelf. 5. Snorkel Gear: Although the water can be a bit cloudy, this is a great location for snorkel gear or goggles will allow you to get a better view of the local pool residents. 6. Surefootedness is a plus due to the steep, uneven and sometimes jagged terrain. Good shoes are a plus, although Keen/Teva type shoes are passable with careful foot placement. Flip flops (slippers) not recommended. 7. Get to know the locals: Do your research on intertidal zones and the local Hawaiian residents. If you have kids (and even if you don’t) taking the time before you head out to get to know the various tide pool species can turn “oh, look, another fish” into an exciting treasure hunt for familiar friends. 8. Guard your stuff! As always at trailheads, please don’t leave visible valuables in the car. It was a great morning. Fluffy omelets, multiple refills of rich dark coffee, and a chance to reconnect with old friends under tropical skies. I’d been on the road for the last few months before finally landing in Maui. Meeting a couple of other displaced mountain dwellers for breakfast got me thinking about the oddly comforting experience of meeting old friends in new places. I’d been feeling cast adrift lately and it felt good to find an anchor, a familiar connection to the known, in a place of so many unknowns. Breakfast was over, and I felt sad to leave my friends. 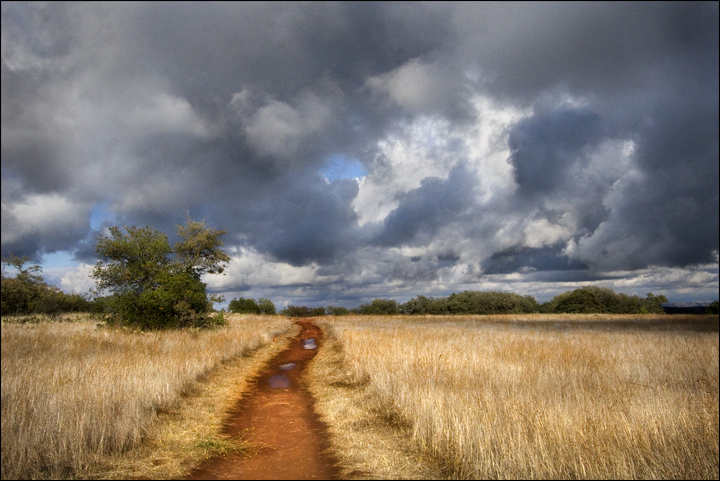 But it was time to head out onto the trail… Makawao Forest Reserve on the east face of the volcano. Climbing ever higher on an unvarying slope, a tunnel of indecipherable tropical greenery looms around me… It’s beautiful, but it all seems so hard to connect with, so alien. Vibrant red mud squooshes out from underneath my soles as I plod ever upward, somewhat unsure if I want to continue. Before I can turn around, the canopy opens up above me, the slope evens out slightly and a meadow appears out of nowhere. At my feet a small plant with serrated bright green leaves catches my eye. Suddenly, I realize that I am looking at an old friend… Blackberries! There’s a whole ripe hedge here! Fiddlehead ferns, taller than any we have in the high country, dominate the meadow, just unfurling their broad spans from tightly curled bundles on the tops of stalks. Pines tower on the edges of the clearing (planted on Maui to serve as ship’s masts), Blueberry’s close cousin the Nene berry is sprouting up all around, and the sharp sweet smell of eucalyptus leaves rises from the forest floor. With a sudden grin of renewed confidence I have all the energy I need continue my exploration. The recognition of familiar plant friends has somehow made the challenge of connecting with new ones far less daunting. Looking back, I have to laugh at myself- I realize that I had been given the same lesson in two different ways. Feeling so adrift, I had forgotten that there is always a seed of the familiar in everything -if we care to look past the obvious differences. 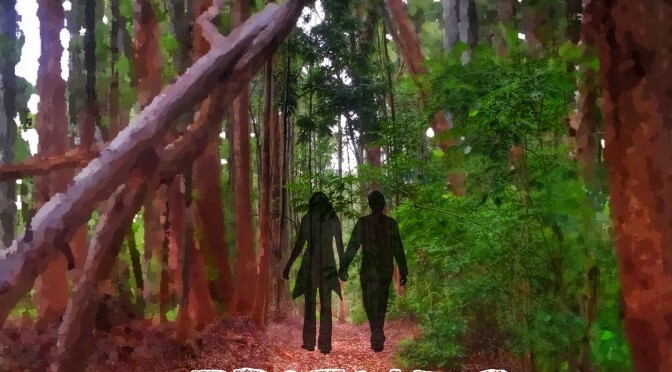 Reaching out and finding a way to connect with your old friends, the knowns, the commonalities, helps you create a bridge to the unknown. 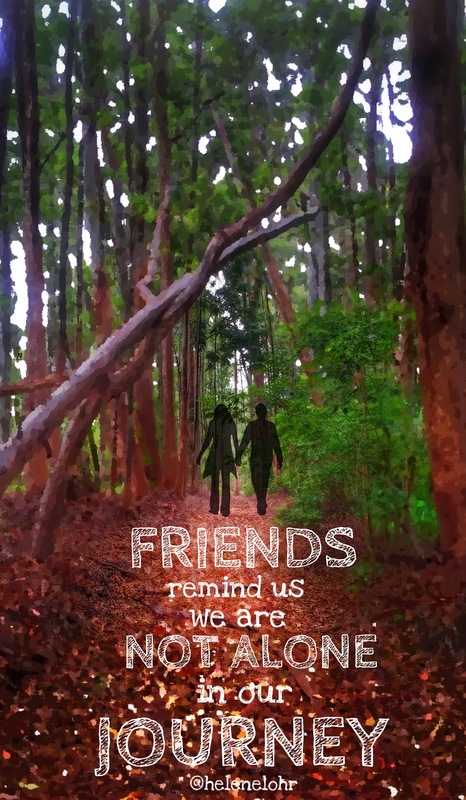 Looking for ways to connect with “old friends” (human, plant, or informational, etc) can help you find a foothold in new territory, make things more comprehensible and give you the confidence to explore an entirely new world. This works not only when traveling or on trail, but applies in just about every disorientingly new experience we have in life. Dark clouds boil across the horizon. A flock of ravens coughs out the last of their calls towards the oncoming storm and flies off towards the thinning blue horizon to the east. I’m in a “scenic” pull out on the side of the road Arches National Park, UT, and things are about to get ugly. Thunder rolls down through the canyons, lightning spikes through the heavy air. A spattering of raindrops becomes a torrent. The rain falls so hard it stings my fingers. Tourists quickly flee for the shelter of their cars. Other photographers flee en masse, shielding precious lenses against the suddenly wasted day. I almost laugh- it’s practically a scene from an “Armageddon” style movie, without the inevitable end of the world, of course. I make a hasty retreat to my trusty 4Runner, swing open the door. Using the running board to launch myself inside, I slam the door against the pelting rain. I take off the sunglasses I still have on my head, uselessly try to wipe off the droplets with my wet shirt. The rumble of cars pulling out of the lot gradually dies down as the others filter out back towards town, towards mouth watering burgers at Milt’s and a tasty microbrew at the Moab Brewery. It’s my decision, do I turn left onto road and follow the crowd out of of park? Or turn right and drive deeper? The rain pelts the windshield so hard and fast that all I can see of the twisted road is a vague blur as the back and forth whine of wipers strains to keep up. Its a half an hour drive until I reach the signs for Balanced Rock. The white noise of the rain on the roof soothes, bringing on a Zen-like state where time doesn’t matter. A beam of sun announces that the deep blue of the desert sky is reclaiming some of its’ territory. The rain recedes into the distance. I roll down the window. The clean scent of wet desert earth washes up through my nostrils and breezes into my lungs. Everything feels lighter. Cleaner, better. The clouds range high above to the southeast, piled up on top of each other. The sun shines down, reflecting through the water vapor. 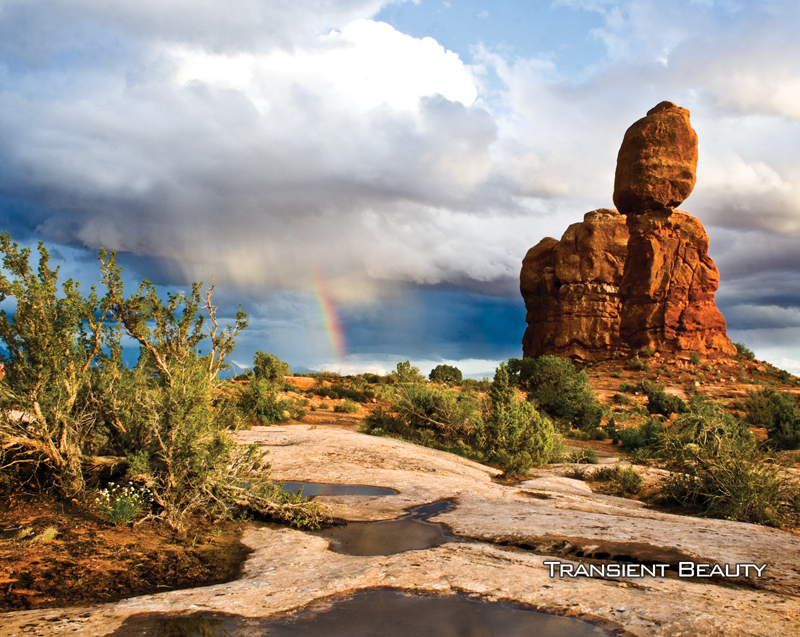 The smooth vibrant tones of a Rainbow form behind the rock. The car door swings open with a slight creak. Canon in hand the rainbow pulls me forward. The cracked red plain feels cool under my feet. The rocky plain warms up in the sun. 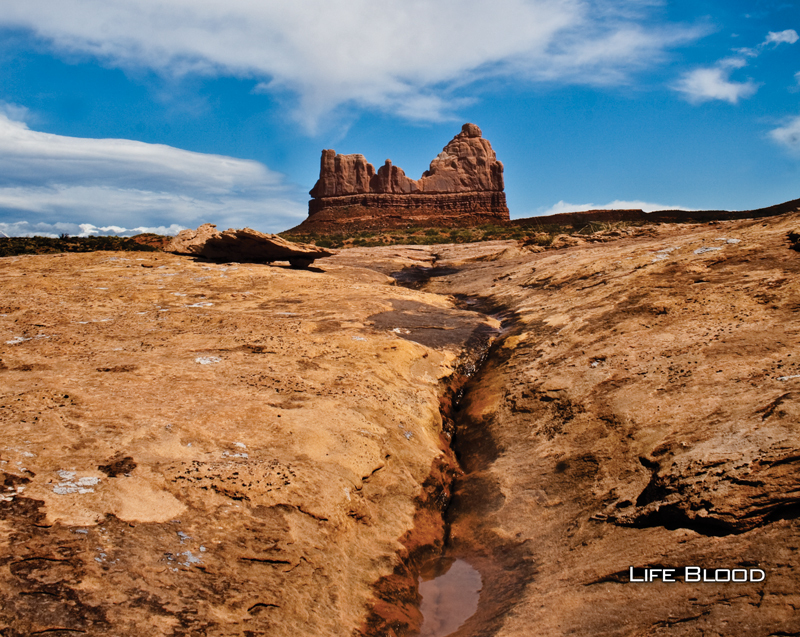 Rivers of water are dying quickly to rivulets, the cracks in the rock of the desert floor drinking up their life blood. Pools of vanishing water reflect the dramatic sky. I shoot for hours, barely noticing as the occasional car makes a hum in the distance – people slowly filtering back in to explore the park. I reach the trailhead to Delicate Arch as the sun swings low down the horizon. The sandy trail is perfect. I throw my shoes into my backpack, swing it up onto my shoulders, nestle tripod into the notch of my right shoulder. Some of the tourists have ventured back into the park and I nod my way past surprised looks as I run barefoot up the trail past them. Bare toes digging deliciously into the wet sand soil, I book it up the trail towards Delicate Arch as the sun sets behind me. The sun beats me up the trail. At the Arch a raven struts along the smooth golden red bowl below. The gold fades to yellow, then gray. The crowd sifts away. I’m left alone with a brilliant splash of stars and the dark silhouette of the rock surrounding me. I don’t have my timer for a long exposure to capture the stars, but that doesn’t matter now. Now is not the time for photos… I lay back into the rock, rest my head against the rough stone and soak in its’ warmth. I have my headlamp, my gear and my backpack. In a few hours, I’ll head back down, check in at the friendly little Rustic Inn. But now? I’m over the Rainbow… This is as good as it gets. You won’t meet Charlie if you speed on by. If you book your regular cushy first class seat on the plane you’ll cruise above him at a cool 30,000 feet. Cruising along the Interstate you’ll blaze right on by without a moments thought. 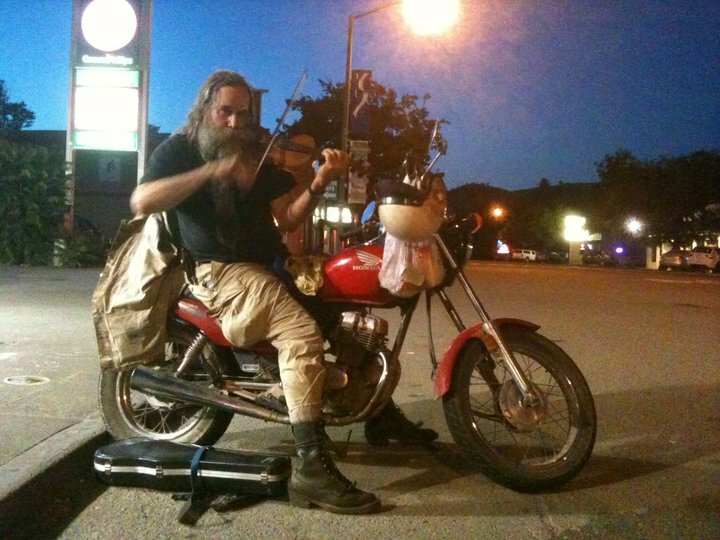 Even if you pull off the highway and do run into him, most likely you’ll look right through him – just one more hippie biker in Garberville, CA – just one more person you don’t trust enough to interact with and don’t really have time for anyway. Missing out on music that touches your soul. Just try it. Sit on a curb outside the 76 station. Breathe in the sensation of it. The curb is gritty under your fingers. Hear high notes swirling all around you– a man playing for the sheer joy of it. Close your eyes and take it in. The sharp smell of gasoline and grease, the slightly warm cement of the curb supporting you, feet in the gutter, your ears grasping to capture every sound. You lean into the music. No tickets, no crowds, no seats- your own private concert. I’ve noticed that it’s so damn easy to miss out on the good things in life. So easy to opt for the comfort of anonymity, of minimizing contact and risk, the convenience of speeding through our lives to get the the parts that we think matter. I’m not saying you have to give up these conveniences, just be aware what you are doing- and that you might be missing something of value. Next time slow down and wake up to your own life. Are you really living it or just speeding through? Travel is a bridge to everywhere. Not just to the spaces on the other end of the road. Not just through the woods and across the ocean. If we let it, it can be a bridge that reaches within as well as outwards into the world. If we live it, if we dare to truly experience other places, other people, other languages and cultures with an open mind we must expand our way of thinking. As your mouth hesitantly tries out the slippery syllables of a new language, as you roll a new taste across your tongue, as your eyes drink in the world around you, you become wider, larger, simply more, than you were a moment before. The adventure is not simply “out there” but also within yourself. Truly letting yourself experience the world around you will inevitably open you up to different ways of thinking, of questioning lifelong assumptions, of realizing that not only could you be wrong, but that you often are. Tolerance, understanding and an odd peace take root in your soul. If you’re lucky you can tap into that understanding in the future. 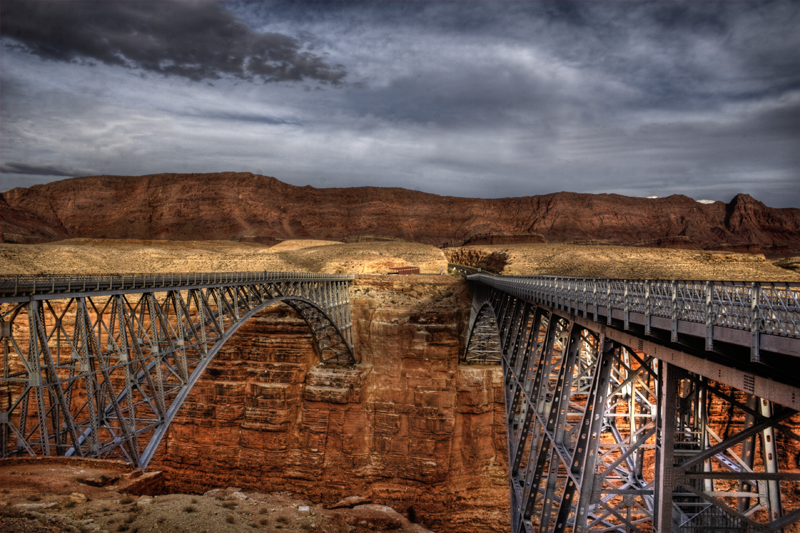 Travel can be a bridge to everywhere… if you let it. A scoop of utter delight. A Cioccolato so rich and dark, that I’m sure it’s the true essence of chocolate melding with my taste buds in utter ecstasy. It’s one of those moments that you remember, when all your senses become more intense. 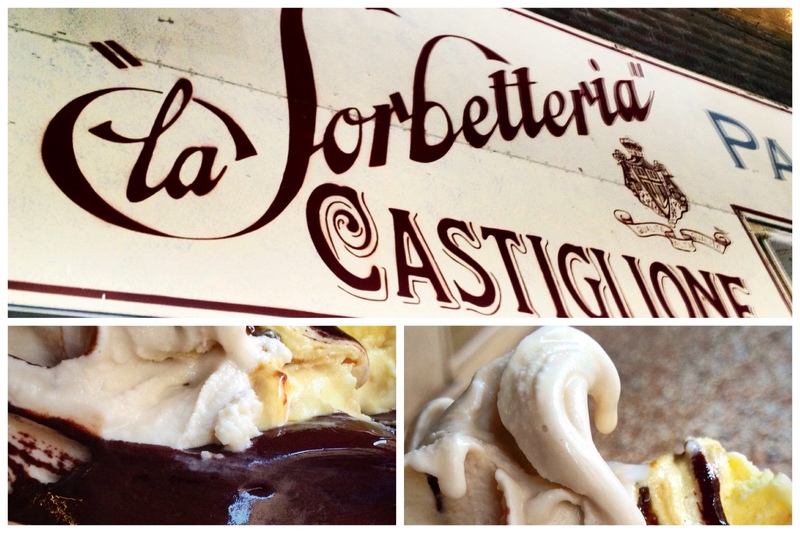 The buzz of mopeds whizzing by, the sunlight reflecting warmth off of the golden red buildings and down into the alleyway, and my heavenly first taste of chocolate gelato from La Sorbetteria Castiglione in Bologna. Oh yeah, it was that good. Angels should be blowing golden trumpets, because I’d arrived at the pearly gates. Gelato is a uniquely Italian art. The original traditions, techniques and machines for making the perfect gelato were developed in Italy. The flavors themselves are like the italian people- both serious and mischievous, with passion and subtlety all rolled up into one. If you’ve had truly good artisan gelato, it’s an experience that you will remember. 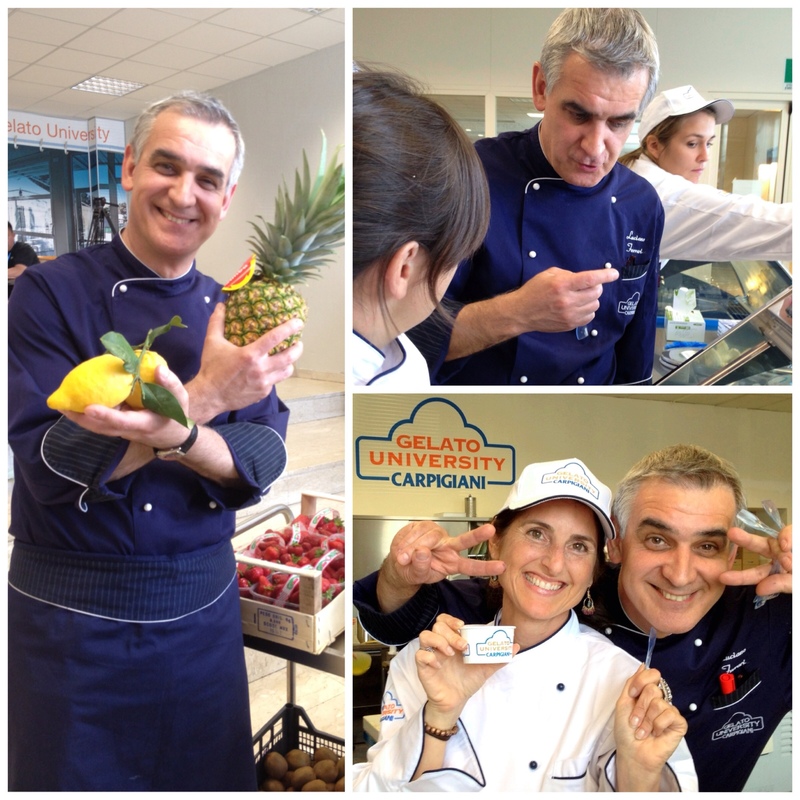 At Carpigiani Gelato University, just outside of Bologna, my dear friend Gina (@suuperg of Gitanablog ), the awesome @jeanettekramer of Latitude Travel and I got the chance to dive into this wonderfully addictive world of icy sweetness. Even though I’ve sworn off of sugar in all other areas of my diet, for real Italian gelato I’d decided to make a very special exception! Our lovely guide Valentina smiles and gestures into the large work bay, explaining the Carpigiani philosophy: the entire mission of the University is education in the making delectable artisan Gelato, in the spreading of the Italian culture of good taste and the choice of quality ingredients over ‘fast food’. Unfortunately the fast food culture has reached even into the arena of gelato. There are a lot of “fake” gelatos out there. Many companies use substandard materials, using unnatural ingredients to boost flavor, fillers to thicken the mouth feel, and preservatives to increase shelf life of their “product”. 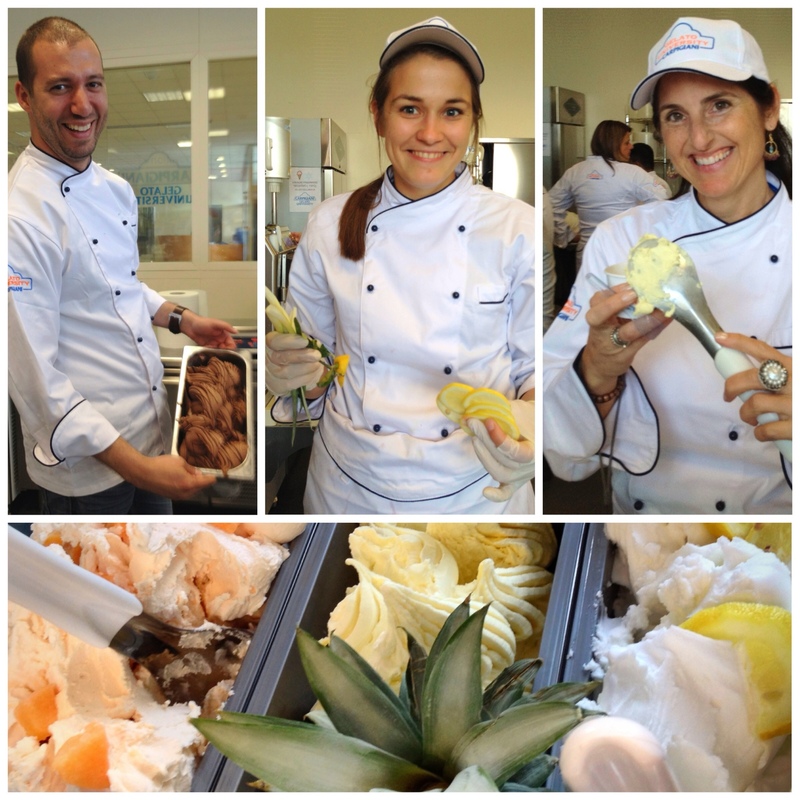 Carpigiani University of Gelato has entered the fray to combat this trend with their long history of sweet excellence. 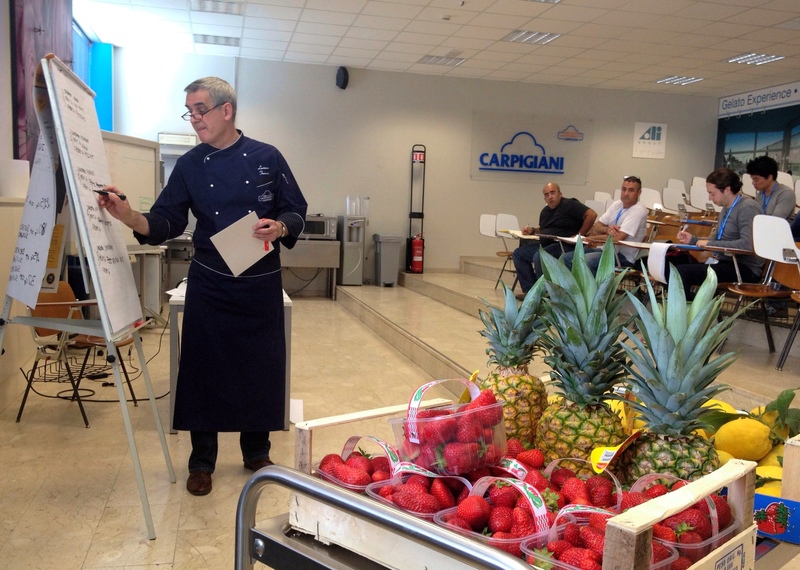 At Carpigiani, the makers of gelato are true artisans, crafting new favors in accordance with traditional principles of respect for their ingredients and their craft. We walk towards the classrooms through a corridor above the factory floor. We pass machines old and new- a walk through the history of the craft from machines powered by hand cranks to the latest digitally controlled models. The long tradition of the company is reflected along the hallway. In the lecture hall Gelato Professor Luciano Ferrari picks up a glowing yellow lemon from a table absolutely covered in vibrantly fresh fruit. My mouth waters. He holds it up for the students and tosses it lightly into the air. It will be their mission to transform this fruit into delicious gelato using a combination of scientific formulas and pure unbridled creativity. As professor, he will be the one to judge them on consistency, flavor, texture and presentation. (Sort of like a of an “Iron Chef-Gelato” competition). Luciano paces at the front of the room, occasionally stopping to write at the easel. With lively gestures emphasizing each of his points, he discusses the true essence of gelato. Behind the simplicity of the fresh ingredients, there’s a complexity of factors that go into making truly mouth waiting gelato: science, art and cultural understanding. True gelato is dense and flavorful, with natural components, no preservatives. 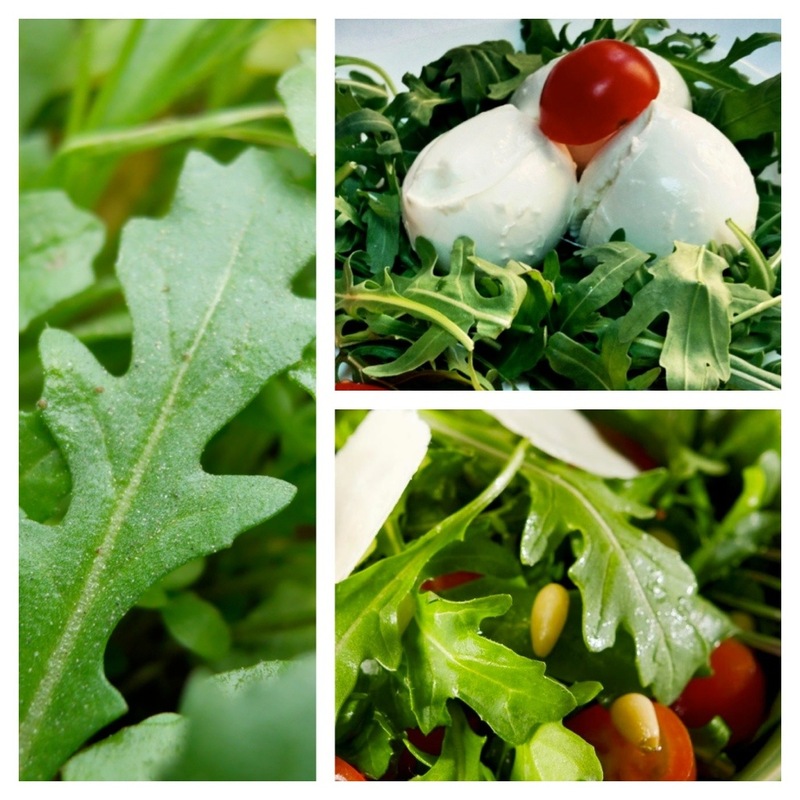 Its fresh ingredients lasts no more than a week. Science and art are happily married at a true gelateria. The focus is on creativity and passion combined with quality and precision. Students must ingrain the formulas for melting points, the effects of alcohol, the amount of sugar, cream, fruit into their brains. How to make gluten free, sugar-free and a whole host of gelato varieties and still make them equally tantalizing is a key concern. Any ingredient can be used, but one must consider its unique physical and chemical properties… Mouth feel, melting point, color and texture are all critical. The class breaks up for the lab section and the air is filled with the chatter of a dozen languages. The program is filled with mix of Italian and International students sharing their enthusiasm for this Italian art. When they open their own gelateria they will become ambassadors of Italian gelato culture, good taste and quality food all over the world. 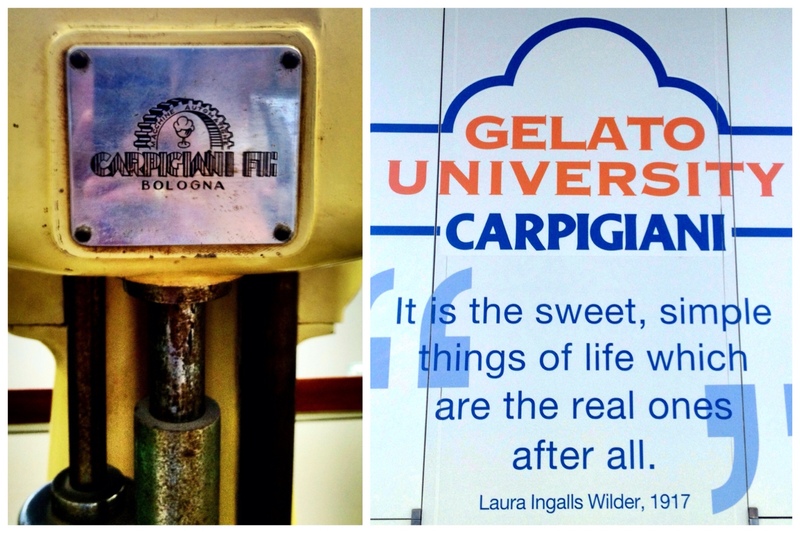 Carpigiani’s plan to spread gelato culture worldwide has already proved wildly successful. Enrollment has doubled in the last 3 years and graduates are opening up artisan gelateria from California to Singapore. 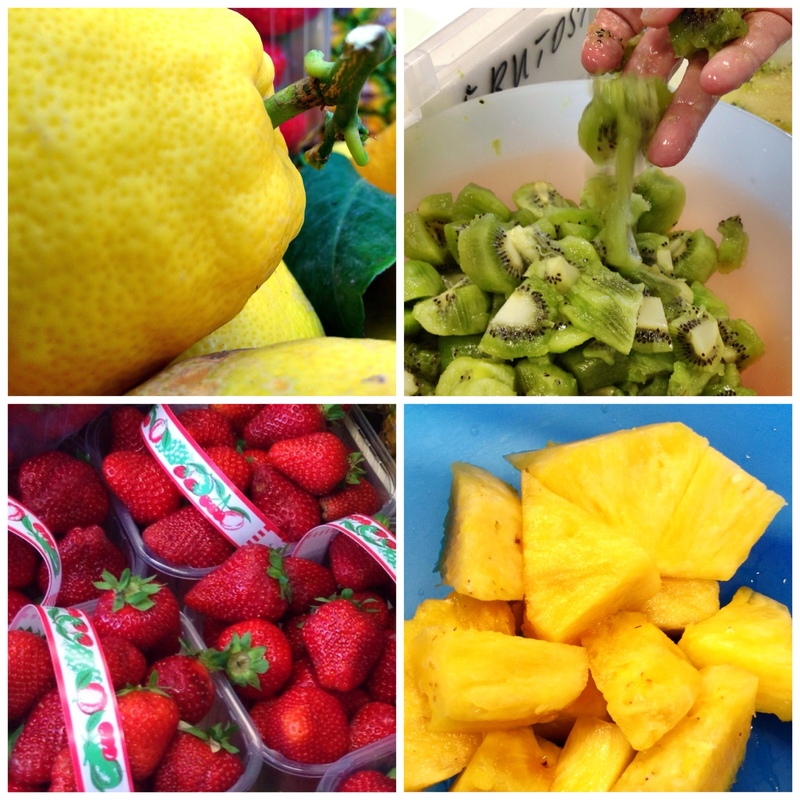 We watch as the fresh ingredients are transformed. Examined, picked, chopped, blended to a smooth and creamy consistency, churned and chilled to the perfect temperature. Did I mention before that my mouth was watering? Luciano’s laughing eyes become serious, considering, as he tastes the gelato offerings of the students. You get the feeling that, for him, enjoying gelato is not only fun, but also a matter of pride, of true dedication. He offers critiques: “Good starting flavor, but unpleasant aftertaste… Good overall taste, but too cold and hard… Not enough pistachio… Too much pineapple”, and finally, (In response to a hazelnut gelato that nearly made my knees go weak) a “Perfecto!”, accompanied by a broad smile. This is the essence of slow food, an ultimate delight. 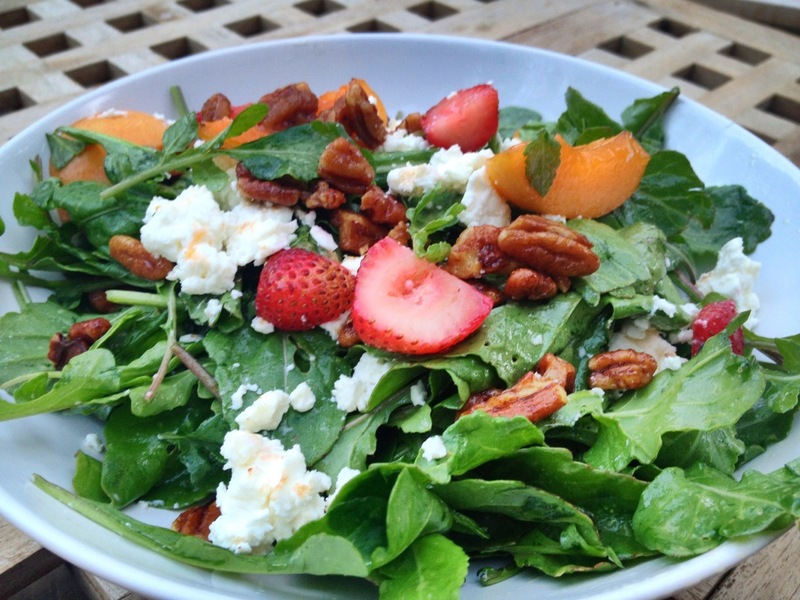 It is a celebration of pure fun, pure joy in the intense flavors. The tart flavors of lemon, tangy raspberry, sweet pineapple and tantalizing pistachio all melt in my mouth. This is a real treat: the chance to savor passion and creativity in every spoonful, every mouth watering bite a treasure to be discovered and enjoyed as the complex flavors dissolve on my tongue. At the end of the day, Valentina drives us home to our apartment in the heart of Bologna. As the sun sets orange and red on the Piazza Maggiore late in the evening and the laughter of friends echos across the square, we all know it’s time for just one more gelato. Delizioso! The world can be such a small place if you shut down, if you occupy just the 4 tiny walls of your cubicle. As the world recedes away from you, you lose sight of yourself. Of what makes you amazing, unique, of the strengths and capabilities that you could develop- if only you reached out.As your world shrinks, so do your spirit and mind, until all that is left is a shell of the life you could possess. But if you decide to stand up, to rise out of your chair and set foot on the path to travel and adventure, oh how the world opens up! It widens until it is unimaginably large- So immense that you may never hope to explore all of its beauty and grandeur. And as the world widens so do your mind and spirit. You learn to understand yourself in new ways. You grow and renew yourself, your purpose and your motivation to strive for more every day. This is my source, my motivation for adventure, travel… for life. I rediscovered the green biscuit tin this morning. 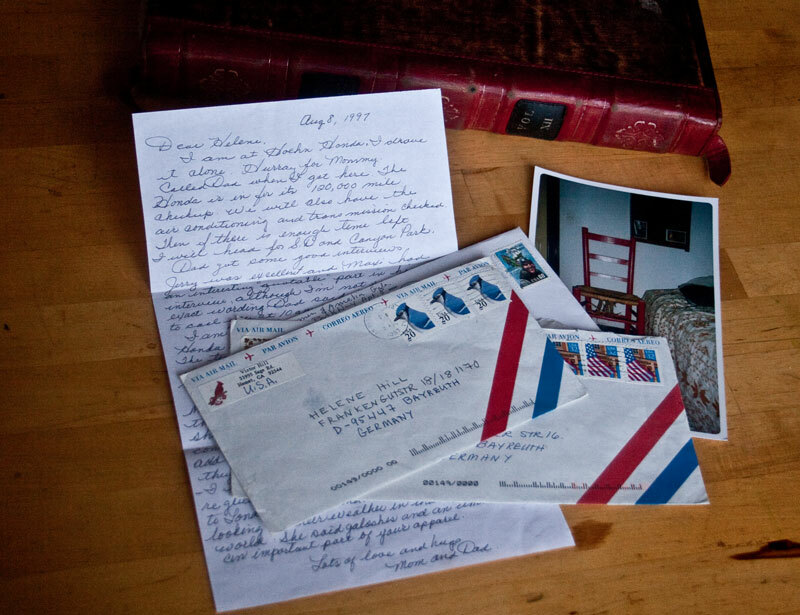 Heavy with paper and coins, it had been wedged in the bottom of a box of old photographs, buried under pictures of faces and places long faded from memory. The currency of other lands is no different. Engraved in wild colors across the surface of thin paper rectangles, these faces and places are tied tightly together with the stories of their nations, their national identity. These strange people that stare back at me from the faces of the notes are everyday names in their own countries, so well known that thousands of fingers have traced their features in passing every day. As I travel through foreign lands, the faces streaming through my hands change. As my fingers grasp the notes, they handle the history of the land, the stories becoming almost tangible. This stream of strange faces fascinates- it is a cracked window, a view into the people I visit and what they truly value about themselves, what they believe about their nation. The rasp of one paper note against the next as I pull it out of my pocket signals value not just by it’s markings, but by it’s cultural baggage. Who do they choose to honor and why? I reach into the green tin and pick up each note in turn. Maria Montessori‘s half smiling face graces the crinkled Mile Lire note… Capital text proudly proclaims: BANCA D’ ITALIA. An Italian physician and educator, she was the founder of the Montessori method of education used throughout many of the world’s schools. Her story speaks of creativity, her dedication to open minded education continuing in the vein of the Italian Renaissance. On Austria’s compact green and brown Hundert Schilling note the Economist Eugen Boehm von Bawerk’s face stares out from behind delicate spectacles and a neatly trimmed beard. All capitals again, the Austrians announce that this note comes from the OESTERRICHISCHE NATIONALBANK. The nation’s pride in his precision and dedication as the councillor in the ministry of finance reflects it’s own virtues. The passionate eyes of Endre Ady the Poet peer out from a purple, gold and green engraving on the 500 Otszaz Forint from the MAGYAR NEMZETI BANK of Hungary. A fiery poet, heavily politically involved, he both celebrated the need for rich cultural life in his country and laid bar the realities of the cruel Hungarian peasant world in his writings. Teacher, economist, poet. The people these nations have chosen to grace their currencies speaks volumes about what their cultures value most. If I let it, the money I carry in my pocket will tell me volumes about the people I encounter and how their view of life, their priorities may differ from my own. Life changes and so does our currency. Humans have a long history of honoring our heroes and the stories we tell about ourselves by carving their semblances into buildings, sculpting their countenances in clay and stone, tracing them onto paper and stamping metal coin as money. 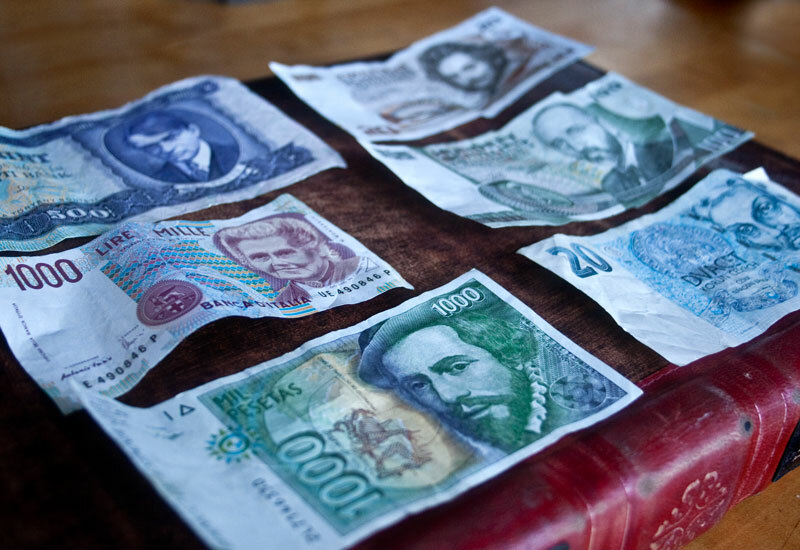 We decorate with and trade in the currency of our own stories and beliefs about ourselves. This is what holds true meaning and value in our bank notes- not just the slip of paper that it has been printed on. As we slide into the convenience of plastic cards and money, I find I miss the comforting rasp of paper money, with its’ tie to the history of the land I’m visiting, the intimate connection between the faces, places and the story of their people. Still, we always find a way to honor those values important to us, to tell the stories that mark our identities… One manifestation of mythos may shade into another, but as a nation and as a person, we will always find a way to mark those ideas and stories that we feel define us.